The winter of 1946 lives on in the memory of those responsible for the biggest advance ever in modern manufacturing techniques. 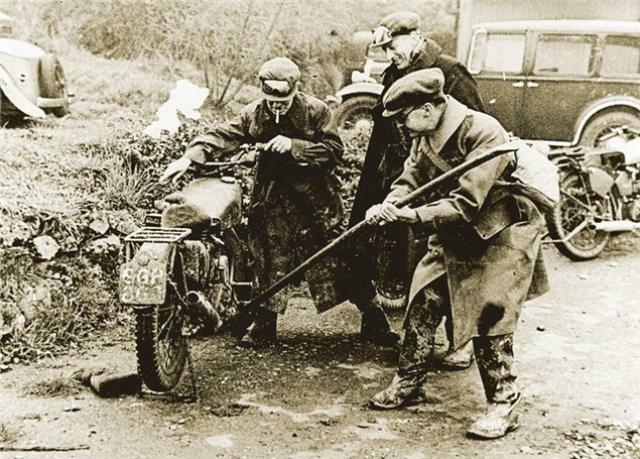 It was during field trials of the new Matchless G3/L that factory test rider Albert Bagg 'encountered difficulties' while negotiating a rock step leading to the ornamental gardens of a Mrs Montague Pitt-Hendry. Bagg had become lost during the night-time leg of the three day endeavour when the electrical system on his machine contrived to function perfectly for two hours continuously - he was overcome by shock, lost his bearings and missed two crucial checkpoints. Mrs Pitt-Hendry's gardener then shot poor Bagg when he mistakenly broached a delicate flowerbed, believing it to be the start of an observed section where Ministry Of Defence officials were eagerly awaiting a five course picnic. This was to be provided by Lord Lucas of Auld Aulternaghter (whose Lanchester limousine can be seen directly behind the three figures attending to Bagg's stricken Matchless). But the unfortunate fatal injury to Bagg proved to be a blessing in disguise. When his un-piloted mount tumbled down the grass bank to cheers from Mrs Pitt-Hendry amid much admonishment from Matchless officials, the frame was found to be twisted three inches out of true. Two inches was then the permitted maximum at the Matchless factory. Works foreman Wally Mallett (centre) was on the verge of sending a pigeon back to the Plumstead works with news of the frame problem when bright-eyed 61-year-old apprentice Ron Bolster cleverly picked up a pry-bar and began to lever the frame straight. effectively used at the works instead of the more time-consuming practice of using a jig. So from February 11th 1946 all Matchless frames were henceforth 'rough-brazed' in place and final truing was performed after painting and final assembly. Bagg was buried with full employee honours in a landfill site near what is now Thamesmead in south London.